NETWORK FINALS: CBS’s NCAA TOURNAMENT coverage adjusted to 1.7/1.2/1.0 (with a Duke game during the first hour), better than the 1.1/1.0/1.1 for last year’s first Friday. Elsewhere, DYNASTY and 20/20 lost 0.1 in final numbers. CABLE HIGHLIGHTS: 14 of Friday’s top 17 cable telecasts were NCAA TOURNAMENT-related, led by TNT’s late primetime North Carolina vs. Iona game. 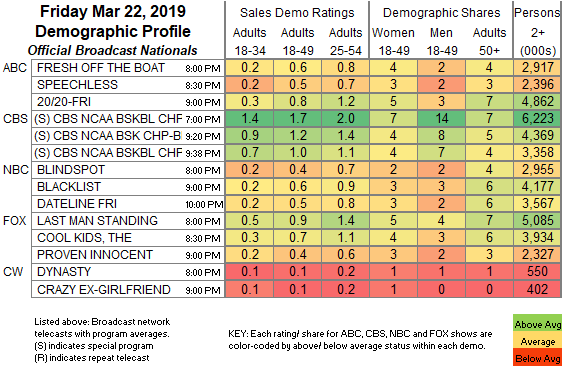 The top-rated show that wasn’t NCAA was Discovery’s GOLD RUSH, down 0.17 to 0.44, with its lead-out hour down 0.26 to 0.22. Univision’s SELECCION MEXICO match was at 0.35. There was an 18-49 tie in cable news, with Fox News’s TUCKER CARLSON TONIGHT at 0.30/0.50/3.2M and MSNBC’s RACHEL MADDOW SHOW at 0.30/0.46/2.9M, while CNN’s ANDERSON COOPER 360 was at 0.22/0.28/1.1M. Food Network’s DINERS, DRIVE-INS & DIVES gained 0.02 to 0.29. 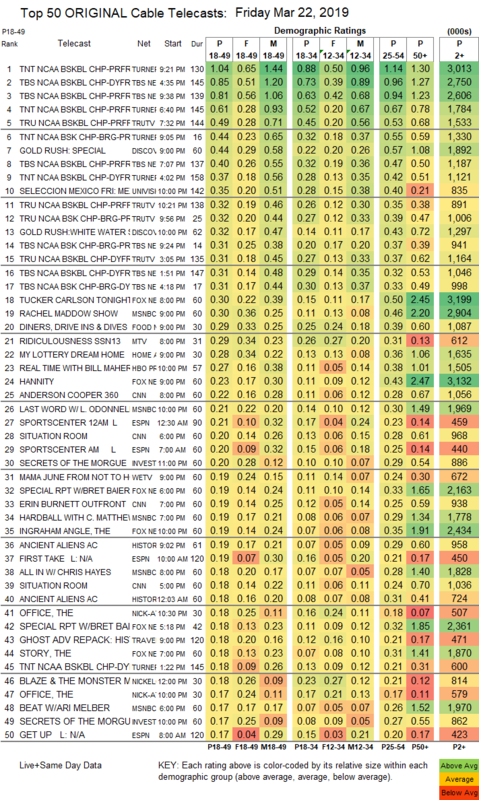 MTV’s RIDICULOUSNESS was at 0.29, compared to last week’s 0.26/0.24. HGTV’s MY LOTTERY DREAM HOUSE dropped 0.04 to 0.28. HBO’s REAL TIME WITH BILL MAHER lost 0.04 to 0.27. On ID, SECRETS OF THE MORGUE was at 0.20/0.17, compared to last week’s 0.23/0.19. On We, MAMA JUNE: FROM NOT TO HOT shed 0.02 to 0.19, and BRIDEZILLAS ticked down to 0.09. Bravo’s DON’T BE TARDY was down 0.03 to 0.16. Paramount’s BELLATOR was at 0.07.